As a retired bar owner Glen Izett “The Bald Chef” has a many drink recipes he has made over the years. There are a few mixed drinks that I like. 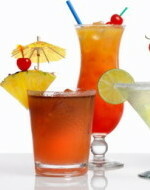 I would like to detail my drink recipes as an on line as a bartender guide here on my web site. Some of the alcoholic cocktail recipes you will find here are all time favorites. If you have a home bar or a bartender these great cocktail recipes that can come in handy. If you are looking for cocktail recipes, non alcoholic cocktail recipes, shooters, or even a great martini you have found a great site. The Bald Chef has some great cocktail recipes that you will find from the classic to the exotic. Think of the Bald Chef as your cocktail master. Martini’s are the classic cocktail in America. If you like to drink a good martin, and want to learn the art of making a great martini drink with all the different variations check out the link. A well stocked bar is key if you want to make great cocktail for your friends or clients. For your basic bar if you want to make simple drinks these are a short list of what you will need to stock. To make great cocktails, shots, and Martinis you need to have on hand this list of liquors, liqueurs, and mixers. In addition to liquors you will also need some liquors’ to make great cocktails and shots and Martinis. This basic list includes these liqueurs. In addition you should have on hand the following mixers. Theses cocktail mixers can be used to make cocktails, shot, and many other types of drinks. Glassware including, Rocks Glasses, Martini Glasses,Double Old Fashioned Glasses, and Shot Glasses. Orange Juice, Pineapple Juice, Grapefruit Juice, Cranberry Juice, and Tomato Juice. Presentation is everything when mixing a great cocktail, shot or martini. Here are a few of the Bald Chefs time tested garnishments.